How would you define a mini-cut? If someone asked you what the purpose of a mini-cut was, what would you say? In today’s episode, Eric, Andrea and Alberto answer these questions, and more. The coaches cover pretty much anything you could ever want to know about mini-cuts: Should they be slow or aggressive? What is an appropriate length? How often should you do one? Are they a requirement? Join us this week for a discussion on what has become one of the most commonly misused strategies, the mini-cut. 2:16 – Why should you mini-cut? 7:31 – In what unuseful ways are mini-cuts used? 9:22 – How often should you mini-cut? 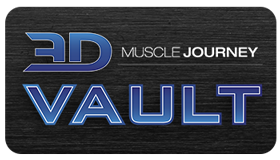 15:00 – After a full competition prep diet, how long should you wait before cutting again? 28:03 – Bulk or Cut? I love listening to these podcasts…you all are hilarious! I do have a question after listening to this podcast though. 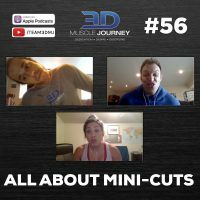 You address how mini-cuts tend to be used for cosmetic reasons or for extending gaining phases, but are they ever useful to test stress responses to dieting? For example, I have debated whether a prep sometime in the next several years would even be feasible given my current work environment. I am a revenue analyst and we are basically at the whim of the Legislature and other special interest groups in terms of determining the cost to the state of their proposed policy changes. Between the months of March-June, my workloads tend to be very unpredictable, rigorous and stressful. I am not interested in prepping anytime soon at this point, as I would actually like to spend time building for a while. However, I am wondering if it is worth ever testing out a mini-cut during my busiest month (usually in May) to see how I respond stress-wise and whether a prep is even worth doing while in my current job?